News International has announced that customers will be charged £2 a week to read The Times and The Sunday Times online from June. 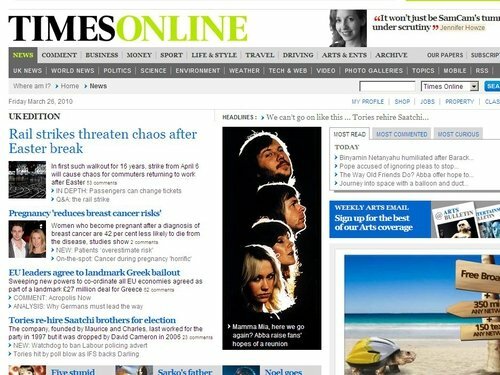 Both titles will launch new websites in early May, separating their digital presence for the first time and replacing the existing combined site, Times Online. The company said the sites will be available for a free trial period to registered customers. From June, customers will be able to view www.thetimes.co.uk and www.thesundaytimes.co.uk, for a charge of £1 for a day's access or £2 for a week's subscription. Payment will give readers access to both sites. The weekly subscription will also give access to certain new applications. News International chief executive Rebekah Brooks said: 'At a defining moment for journalism, this is a crucial step towards making the business of news an economically exciting proposition. 'We are proud of our journalism and unashamed to say that we believe it has value. The Irish Times has also launched a new subscription-based paper for online readers. It replaces the previously free 'Today's Paper' section on its website.